Photo by Matthew Keys, Creative Commons. 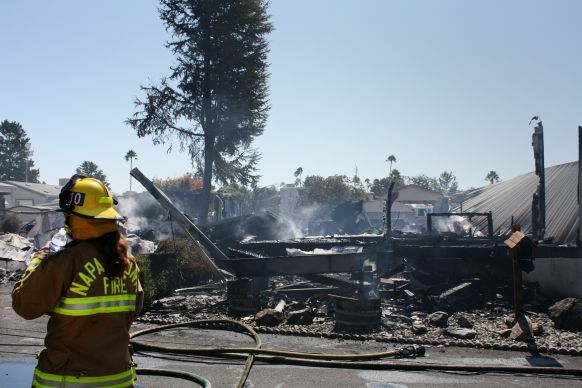 A mobile home park caught fire following a gas leak triggered by the Aug. 24 earthquake in Napa, California. First United Methodist Church there also was damaged. A 97-year-old United Methodist church was among the historic buildings in downtown Napa damaged by the Aug. 24 earthquake that struck northern California. Later that day, Phil Bandy, director of Volunteers In Mission for the United Methodist California-Nevada Annual (regional) Conference, met with the Rev. Lee Neish, pastor of First United Methodist Church in Napa and joined the watch over a sanctuary wall that was bulging away from the building. The wall was in danger of collapse, but Bandy said it was too early to know the extent of the damage. The chair of the building trustees, who was “obviously pretty distressed,” told him the church had been poised to launch a remodeling campaign, Bandy added. The larger impact on Napa church members from what is being called the strongest earthquake to hit the area in 25 years probably occurred in their personal households, he noted. First United Methodist Church of Vallejo suffered superficial earthquake damage when some of the brick façade fell onto the sidewalk but “the integrity of the building itself wasn’t compromised,” Bandy said. Although his home was the same distance from the 6.0-magnitude earthquake’s epicenter as Napa was, most of the Vallejo area sits on bedrock, while Napa is built in a sediment-filled valley. “It (Napa) has a much different shake profile,” he explained. San Francisco Area Bishop Warner H. Brown Jr., and the Rev. Schuyler Rhodes, superintendent of the Bridges District, which includes the affected area, sent prayer and support from Fiji, where they are part of a California-Nevada Conference delegation celebrating the 50th Anniversary of the Methodist Church in Fiji as an autonomous conference. Coincidentally, the United Methodist Committee on Relief is scheduled to hold a consultation with the conference cabinet and staff in three weeks to review the conference’s disaster response plan. “We will be thinking preparedness now,” Bandy said. *Bloom is a United Methodist News Service multimedia reporter based in New York. Follow her athttp://twitter.com/umcscribe or contact her at (646) 369-3759 or newsdesk@umcom.org.